Cologne - It’s back to the training pitches for the 18 Bundesliga clubs on Thursday as the clock ticks ever closer to the opening weekend of 2015/16 top flight action. Well, that'll be that for our live coverage this evening. It's been a pleasure as always and don't forget to join us tomorrow for the latest from Bayern's tour of China, live updates from Dortmund and Wolfsburg's latest pre-season friendlies as well as Schalke and Stuttgart's media days. It promises to be a cracker! In preparation for Schalke's media day, have a read of what up-and-coming left-back Sead Kolasinac has had to say here or relive the champions' entertaining media day here. Bis morgen! Stuttgart helped themselves to a 13-0 win this evening over TSV Ilshofen. You can remind yourself of all the Bundesliga clubs' pre-season results and fixtures here. Catch up on the highlights from the champions' media day over here. David Alaba and the Bayern boys are heading to the Far East. bundesliga.com has rounded up the best of the social media here for you to enjoy. Leverkusen star Hakan Calhanoglu is looking forward to his side's Austrian training camp. "We're going to give it everything in the training camp," reads the tweet below. "The conditions are absolutely great!" Bayern are about to leave for China - safe flight! Leverkusen are ending the day with a little bit of football tennis. The Gabon international certainly looks pleased to be training alongside Kevin Großkreutz. Bayer's new boy Jonathan Tah has been thrust straight into action at the club's training camp in Austria. "Ready for his first training session!" reads the tweet below. Catch up on his signing here. There's a simple motto for UEFA Europa League participants FC Augsburg: "Train hard, play hard"
Luiz Gustavo gives the thumbs up as he nears a return to first-team training with the Wolves. Translation: Meanwhile Baumjohann and Kalou are running laps. Cigerci is training individually with [coach] Vieth. Eintracht Frankfurt striker Nelson Valdez has had his contract terminated by mutual consent. A cruciate ligament injury restricted the 31-year-old Paraguayan international to just ten Bundesliga appearances last season. Translation: Get well soon Sami Allagui! The Hertha striker faces three weeks out after suffering a cruciate ligament tear and bone marrow odema. Thiago has been the centre of attention at Bayern's media day. You can follow all the comings and goings from that one right here. Translation: And we're off. The warm-up is underway. Translation: Just a standard welcome for Roger Schmidt and the Werkself at the Tauern Spa hotel in Zell am See-Kaprun. Germany Under-21 international Leonardo Bittencourt joined the Billy Goats from Hannover 96 this week. VfL Wolfsburg have also had their official team photo for the new campaign taken today. Some of Gladbach’s stars went on a bicycle trip around the Tegernsee this morning. There's nothing that prepares you for life in the Bundesliga like a spot of... canyoning. Translation: [Danny] Da Costa and [Robert] Bauer have gone astray. Hopefully they'll find the exit. 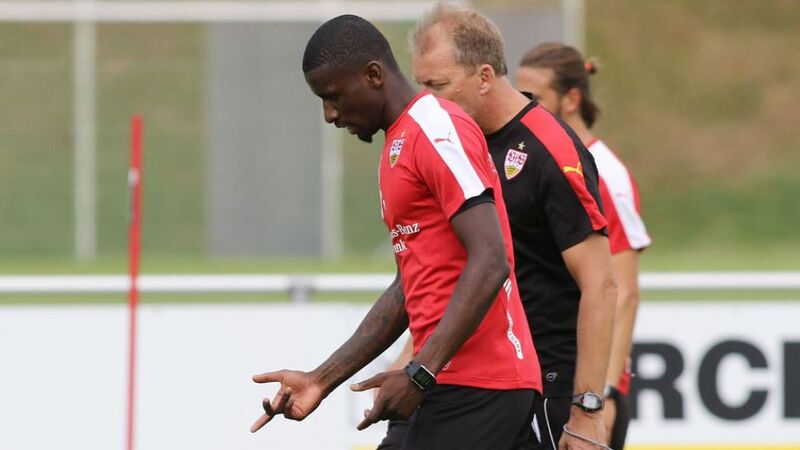 Translation: Individual training today for [VfB Stuttgart defender] Georg Niedermeier, who's suffering from a minor back problem. Translation: Cool down! Our friendly against TSV Ilshofen gets underway at 18:30. The Wolfsburg squad must be nearing completion now, surely? Brazil international Gustavo took part in his first session this morning after playing in the Copa America earlier this month. Translation: Final training session from our camp in Evian. Don't forget your Media Day, though, chaps! Fabian Lustenberger and Peter Niemeyer are officiating as their Hertha colleagues start the day with a quick five-a-side tournament. The Wolfsburg centre-back is taking part in his first training session of pre-season this morning. David Alaba, Thiago and the majority of their FC Bayern colleagues are due to fly to China this evening, but the Bavarians will depart for Asia without the injured Franck Ribery and Arjen Robben. Everything's been going to plan for Werder during pre-season. The Green-Whites have won five of their six friendlies to date, including their Audi Quattro Cup victory in Salzburg. Translation: The morning training session is underway. Translation: Preparations are underway for the upcoming training session. The lads will be sweating here from 10 o'clock! Here's Borussia Mönchengladbach's morning schedule. The majority of Lucien Favre's squad will be riding their Fahrrad around the Tegernsee this morning, while the likes of Patrick Herrmann, Granit Xhaka and Thorgan Hazard will be put through their paces in an early training session. Werder beat TSV 1860 Munich 3-1 and a Tyrol Regional XI 4-0 on Wednesday, but the Green-Whites will be back on the training pitch at 10am CEST this morning. Translation: Good morning from the Zillertal! After playing twice yesterday we're back in training at 10 o'clock. Translation: The tension rises - things are about to get cold and wet!